Due to various circumstance, session 7 was a short session, so I decided to wait until the next session to do the write-up… then the next two sessions were canceled. I made the Nov. 27th session into an extended session to make up time (start 2 hours early, end 1 hour late). The crew of the Desperate Measures arrived on Taris ready to find the Imperials responsible for weaponizing Rakghoul plague. Once there, they had no leads on who to contact, so they sought out an information broker in one of the skeevier cantinas: The Rank & File in Crimson Sun Plaza in the Shan District. There, they found a Gran, Bok Kel who was more than happy to provide the information they wanted, for a price. The crew of the Desperate Measures found the price too high, though, so they roughed him up until he lowered his price to a more acceptable level. He directed them to Bela Gorley, a man who supplied Imperials with restricted artifacts from Ancient Taris. Bela Gorley lived in the Lhosan Arcology in the Onasi District. They took their speeders and went to visit Mr. Gorley, walking in to find a group of black-clad assassins in the process of ending his life. They killed the assassins, but were too late to save Bela. All was not lost, however, as they found a call log that showed his last communications with with someone named Sharone Het. A bit of research uncovered that Sharone Het ran a shop in the Commerce Emporium spanning the Shan and Onasi Districts. Scoping out Sharone’s shop, the saw it was a small electronics parts store. Daesha performed interior recon by posing as a customer, and once it was determined the front door was the only way in, the rest of the group came in, distracted him and stunned him. They then closed the shop and started their interrogation by having Doc Cousteau shoot him up with painkillers until he was as high as a thranta. (GM aside: *sigh* He would have been cooperative had they just asked :p) Eventually they discovered that Bela referred the mercs to a university researcher named Mayven Turloc and also kept her competitor, Jorunn Dox in the loop. A quick check with the Leontyne Saresh University revealed that it was between semesters, so Turloc was out on one of her undercity digs. They decided to pay Jorunn Dox as visit. Jorunn lived in a run-down arcology in the Olaris District, Lost Colony. When they arrived, they found him in the public directory and paid him a visit. Unfortunately, he was dead already, his throat slit. He was not a smart man, however, and had an unsecured personal terminal. On that terminal, they found extensive maps of Mayven’s dig sites and plans for a heist. Jorunn Dox was the type of man to steal other researchers’ work and sell them for personal profit. Stocking up on supplies procured with money they got out of Bela Gorley’s accounts (he didn’t need the money anymore), they ventured into the undercity, following Jorunn’s maps. The route was lit with worklamps, though it was not without dangers. After several hours of spelunking (had we not cancelled so many games, I would have some of these laid out with Dwarven Forge and RPed the environmental hazards, alas), they discovered a modern, fortified door set in the decrepit, ancient wall. A body was outside of the doors, still possessing a keycard. Fortunately, the keycard opened the door and allowed them to bypass the installed autoturrets. The rakghoul still wore tattered remnants of clothing and also had a keycard labeled Tarisian Central Bank. After finishing their sweep of the abandoned facility, they went back to the Commerce Emporium and withdrew the lockbox. Inside, they found extensive notes from Mayven Turloc, 500 credits, and records of correspondence between her and Dorn Maka, the hapless dead fellow they found outside the lab. In a nutshell, Mayven was hired by the Imperials to find the ancient facilities where Rakghoul Virus was first weaponized back during the Great Galactic War. She did so and her reward was to be a test subject: Patient Zero. Once the virus was working, the Imperials moved the Black Argent facility to a secured location with a familiar name: Imperial Star Destroyer Stormhammer. The crew of Desperate Measures returned to Mirial. The base was a flurry of activity and they could not help but notice many starfighters now there. Major Vri’bek welcomed them back and briefed them: a star destroyer was en route to the Mirial rebel base. Fortunately, a small flotilla of rebel ships was also enroute to provide support. Captain Ackbar commanding the Nebulon-B Frigate Independence and three corvettes, along with two flights of Y-Wings, five flights of X-Wings, and Desperate Measures would take on ISD Stormhammer. Ackbar’s plan was for the X-Wings and Desperate Measures to provide cover for the Y-Wings and take out as many TIEs as they could while the capital ships would take on ISD Stormhammer and any TIEs that lingered behind to provide support from within the Star Destroyer’s weapons range. I apologize for the crudity of this model; I didn’t have time to make it to scale. Six hours after returning from Taris, Desperate Measures took to the sky once more. As soon as ISD Stormhammer dropped out of hyperspace it launched fourteen flights of TIE Fighters, four of which stayed close to the mothership. The frigate and the corvettes advanced on Stormhammer while the fighters engaged the Imperials. The bombers were caught without protection for a while in the massive furball, but the superiority of the Rebel pilots more than made up for the Imperial’s superior numbers. Marcus saw an opening once most of the TIE fighters engaged with the Rebel fighters were destroyed and led his flight on a daring attack on the star destroyer’s conning tower. 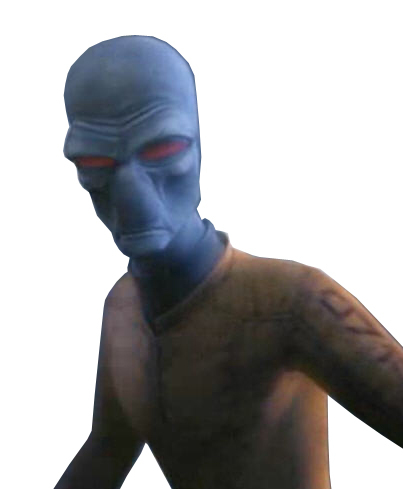 After using most of his proton torpedoes, he managed a lucky strike on the port shield generator and Stormhammer was vulnerable. One flight of X-Wings starting pounding the destroyer’s engines while the frigate and bombers opened up with full salvo’s on its unprotected flank. Stormhammer attempted to turn, but was too slow to keep the fighters from exploiting its weakness. In a last ditch run, Marcus fired his last proton torpedoes at the bridge, scoring a direct hit and crippling the ship! Stormhammer tried to flee, but Ackbar was relentless and the Rebel destroyed the star destroyer. The mon calamari captain gave the grim order to destroy all the escape pods; the chance of the Rakghoul virus surviving was too great. They returned to Mirial to a well-earned celebration. Doc Cousteau was offered a commission as a Captain in the Rebel Alliance, befitting his status as a doctor, Marcus was offered a position as a Squadron Commander, and the rest were commissioned as Lieutenants. After the medal ceremony for all the rebel pilots, the celebration lasted well into the night. They later received word that Captain Ackbar recieved a promotion to Admiral as a result of his leadership at the Battle of Mirial. As a result of the extended playtime, we were able to wrap up the campaign! I also rewrote part of the adventure so that there was actually a chance to do just that; I wanted to wrap the campaign up this year (my original plan was to wrap it up before Hallowe’en). My original plan was for a campaign in 6 Episodes: Invasion of Telos, Mission to Ithor, Mission to Manaan, The Plague Investigation, Raid on Krupx Munitions, and Assault on ISD Stormhammer. The final mission was always going to be a massive space battle against a Star Destroyer, with the PCs flying Desperate Measures (and since one of the PCs was a squadron leader, I was going to give that PC a flight of X-Wings or Y-Wings to command). My only real complaint is that I had to abstract a good portion of the final battle. FFG’s system isn’t really set up for a message space battle ala Return of the Jedi. Sure, I could have rolled for every weapon able to fire on each of the capital ships (there were 5), but I would have spent the majority of the battle playing by myself (as you can see, there were also a lot of rebel ships. Still, it was a suitably epic conclusion. Doc Cousteau’s hyperspace calculations were on the money and after a few weeks of travel to the core system, the ship dropped out of hyperspace in the Alderaan system. Greeted by the serene beauty of the “Shining Star of the Core Worlds,” they followed the coordinates provided by Dirk Thanos to the island city of Belleau-a-Lir. Athena’s Jewel was granted permission to land and when they disembarked, they found a comfortable transport waiting for them. The transport took them through the city center to the Panteer compound, a luxury high-rise surrounded by parkland. Silar Panteer was there to meet them. He explained that Dirk had sent ahead word of their visit. He showed them the apartment suites each was provided and explained the amenities to which they had access. Silar expected Dirk to arrive in a few days. Marcus offered the crate of Blossom Wine they took from the Dalton Exchange to Silar, but due to a miscommunication, it was accepted as a gift, rather than a trade for equipment. While they waited, Daesha and Doc worked on changing the transponders on Athena’s Jewel, rechristening the ship Desperate Measures. After a few days of rest and relaxation, Dirk Thanos arrived. He immediately called them into a conference room and formally extended an offer for them to join the Alliance to Restore the Republic. After accepting, the group was assigned with their ship to the Rebel Base on Mirial. It was quite a distance away, however, so en route, they were to stop at the Nebula Star Resort & Casino in Mandelorian space and meet with Commander Grell “Fancy” Fagun. He had a special job for a team of operatives with a ship. Located in the Gargon system, the Nebula Star Resort & Casino was technically neutral territory, so Dirk did not expect them to run into any Imperial entanglements, though they might encounter Imperials on leave. The fledgling Rebellion struggles to establish bases and supply lines as it is continually hounded by the forces of the Empire. Citizens flock to rebel bases across the galaxy in the hopes of lending their skills to the war effort. The influx of refugees and would-be freedom fighters to the rebel base on Mirial creates a shortage of bacta. The base leaders turn to a new team of rebel allies to travel to Ithor and procure the life-saving substance from a friendly supplier. Despite the Imperialization of many corporations, there are sentients in the employee of these companies willing to help the Rebellion forces. They do so in secret and at great risk to themselves…. Travel to the Nebula Star was without incident. Desperate Measures was allowed to dock and they were welcomed to the casino. Once they made contact with Grell Fagun, a little verbal song-and-dance verified their identities and he invited them to join him in the Starlight Casino up on level two. The casino was currently swarmed with Devanorians on shore leave, and was an ideal place for a clandestine meeting due to the volume of their carousing. Grell “Fancy” Fagun wore gold-trimmed emerald silk clothes and greeted them like old friends. Once a round of drinks was delivered, he dropped the charade and got down to business. The Rebel Base to which they were assigned on Mirial was struggling with an influx of refugees and would-be freedom fighters and, like most Rebellion outposts, was running out of bacta. Since they trading and sale of bacta was strictly controlled by the Empire, the Rebellion was forced to procure it via extra-legal means. Fortunately, such a supplier, Chodo Both, an Ithorian was willing to supply them with bacta. All our heroes had to do was travel to Ithor, dock with the herdship Mother Ithor, trade credits for the bacta, and take it to Mirial. In theory, a blue milk run. Naturally, complications arose immediately when an Imperial Star Destroyer arrived at the Nebula Star to partake of its recreational offerings. Our heroes beat a hasty retreat, heading back to their ship, splitting up to minimize the chances they’d be recognized as a group. Unfortunately, a bounty hunter and two Klatooinian thugs awaited them. Maxton Dalton had issued a bounty for the slicer who failed to cover up the theft of Athena’s Jewel, and he was there to collect. Marcus tried to reason with the bounty hunter, but very few can cause a hunter to back down from his or her game and the docking bay erupted in blaster fire. Despite delivering a serious wound to Lisska Sish, the group made short work of the bounty hunter and his hired goons. Doc took the unconscious hunter’s helmet, revealing him as a Zabrak, as everyone else removed his weapons. The hunter’s guild ID identified him as Etho Dōk. They left before any alarms sounded from their brief firefight and jumped to Ithor. The flight was long enough to heal Lisska’s wounds, and the friendly Ithorians allowed them to dock with Mother Ithor to meet with Chodo Both. After a two kilometer hike through they herdship’s Great Atrium, they met up with Chodo as he tended his garden. He acknowledged the terms of the bacta trade, but refused payment, instead asking that the plant the seeds of the joruba plant on Alderaan, spreading life as payment for his gift of medicine. During the negotiations, the ISD Stormhammer arrived to inspect Mother Ithor. Among the inspection troops boarding Mother Ithor, our heroes recognized an old friend from Telos, Jan Caffree, now dressed in an Imperial uniform. Rather than confront her, they choose to flee through maintenance shafts and return to the hanger where their ship was docked. Chodo arranged to have the bacta transferred through the same route while Daesha worked on slicing into the Imperial network to grant their ship clearance to depart. Her efforts were rewarded with great success and to the surprise of the Imperial controllers, Desperate Measures had clearance to depart Mother Ithor in direct contradiction to the Imperial No-Fly Edict. They made their way to Mirial, where the arrival of the bacta was welcomed with much rejoicing. They took the opportunity to discuss equipment requisitions with the base Quartermaster and the base commander, Major Girov Vri’bek, a male Bothan welcomed them to the Rebellion and gave them their first official mission as members of the Mirial Outpost: check on the Alliance listening post in the neighboring Listehol system and determine why communications have been lost. He ordered a supply of repair parts and diagnostic equipment to be loaded on to their ship for on-site repairs. As they prepared to depart, the base erupted in chaos. News poured in from across the galaxy: Alderaan was gone–destroyed, by the Empire. … thus bringing Dawn of Rebellion officially into the timeline of Episode IV: A New Hope. I’m really enjoying how easy this game is to prep for. Of course, since I know fights aren’t going to take up 50% – 75% of a session, I have to have a lot more plot prepared. That’s quite all right, of course, everything is proceeding as I have forseen. 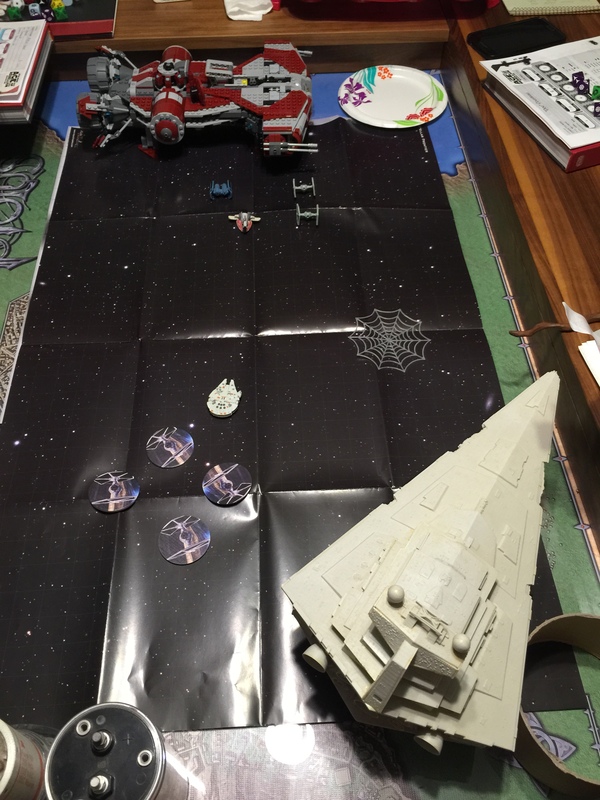 At our last game session, we kicked off a new campaign, Dawn of Rebellion! 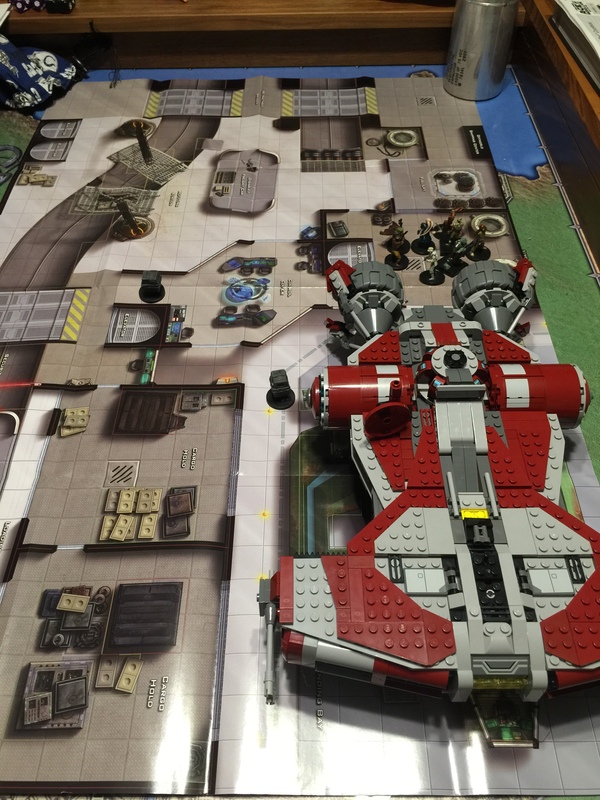 This campaign is set in the Star Wars universe, shortly before the events of Episode IV: A New Hope and uses Fantasy Flight Game’s Star Wars Role Playing Game system (specifically, Age of Rebellion). As before, you can keep up with the campaign over at Obsidian Portal, but that will only have session synopses; post-game analysis will only be posted here. It is a period of civil war. A group of freedom fighters known as the Alliance to Restore the Republic struggles against the iron fist of the Empire. On the Outer Rim planet of Telos, in the capitol city of Thani, a covert rebel cell works tirelessly in an attempt to break Imperial codes. Unbeknownst to the innocent citizens of Telos, the Empire is about to exact swift retribution upon the rebels of the city, and every citizen will have to make a choice…. Daesha Freykaa, a Twi’lek (spy) Slicer. Ren Meljyne, a Sullustan (ace) Pilot. Marcus Horne, a Human (commander) Squadron Leader. Picture it, Thani, capitol of Telos, midweek, midday… Doc Cousteau, Lisska Sish, Ren Meljyne, and Marcus Horne are enjoying their weekly lunch together in the Bizz Buzz Café. Employeed by the Dalton Exchange, they all meet regularly to swap gossip and network. As they were awaiting their order, two friends of their, Jan and Beth Caffree entered the cafe and took a nearby seat. The sisters were embroiled in an heated argument that seemed to be about clandestine activities and loyalty to the Empire. Jan stormed out and Beth apologized for her sister’s rude behavior. As they were finishing lunch, the ground trembled. Lances of fire rained down from the sky toward the outskirts of town; an orbital bombardment. TIE Fighters screamed overhead and Imperial dropships set down in the plazas and parks, disgorging white-armored stormtroopers. The lunch buddies made their way through the streets back to their office. Beth called to them from a nearby alley. Her sister was across the street speaking to an Imperial Office, while she clutched her side in pain. It appeared as though she’d been shot. She passed a data stick to Ren Meljyne, telling him to take it to Dirk Thanos at the Commerce Guild Office. Beth ran off, distracting the stormtroopers with some blaster fire and leaving the lunch crew with the data stick. They continued to the Dalton Exchange offices where they retrieved some personal belongings from their lockers. Already, Thani was on lockdown, with Civil Defense advising people to stay off the streets and cooperate with Imperial forces. Meanwhile, holocam footage of Imperial Forces was playing showing them rounding up dissidents. Fortunately, the Commerce Guild office was but a few blocks away and all of the large office towers were interconnected with maintenance tunnels. Imperial activity seemed concentrated to the west, so they correctly surmised that the maintenance tunnels would be relatively empty while their co-workers were glued to the news reports. Despite some locked maintenance doors, they were able to reach the Commerce Guild office. Convincing Dirk Thanos to meet with them was relatively easy once they named-dropped Beth Caffree. Once he was satisfied that they were relatively trustworthy, he confided that the datastick contained sensitive information vital to the Rebel Alliance and if they were associates of Beth, sooner or later, the Empire was going to come looking for them. They decided to throw in with Dirk and the Rebels. He asked them for a big favor, their first act of open rebellion: collect a team of slicers from a warehouse on the edge of the city and get them off-world. While they geared up, they discussed plans. The Imperials had Thani spaceport locked down, but it was known that the Dalton Exchange building had private docking bays used by Mr. Dalton and that he was a collector of antique vehicles, at least one of which was a space-worthy reproduction of a light corvette from the Great Galactic War. It was surely under lock and key, but the new rebels hoped at least one of the slicers would be able to help with that. Using a Commerce Guild hovertruck, they located the warehouse and met up with the slicers, using the passphrase provided by Dirk Thanos. They got the slicers loaded up just in time as an AT-ST rounded the corner. The Imperials commanded them to stop for inspection and the chase was on! Evading the AT-ST’s fire, blasting through two checkpoints, and jamming the Imperials’ transmissions with the truck’s meager transmitter, the rebels finally lost their pursuers in mid-day traffic on the highway. They ditched their vehicle in the Dalton Exchange garage and used the maintenance equipment to move the slicers’ gear up to docking level of the Dalton Exchange building. A protocol droid started questioning them and demanded they leave only to catch a face full of blaster fire from one of the slicers. They went to work slicing into the security systems. Athena’s Jewel awaited them, fueled and ready to go. While one of the slicers, a twi’lek named Daesha Freykaa, created a distraction by slicing into the city’s emergency broadcast systems and setting off all the alarms at the spaceport, Marcus, Doc, Ren, and Lisska loaded a couple of speeder bikes and crates of valuables into the ship’s cargo hold. With the Imperials’ attention fixed on the spaceport’s false alarms, they were able to haul jets and head towards orbit before the Imps spotted them. The jig was up by the time they reached orbit, but more TIE Fighters had to be scrambled from the Star Destroyers in orbit and they were well on their way to the hyperspace jump point by the time the Imperial ships launched. Daesha attempted to slice the Dalton Exchange records to cover up their theft, but met with much less success than she did slicing the city’s network and Athena’s Jewel jumped to hyperspace, bound for an Alliance safehouse on Alderaan…. Not bad for a first session. It took a bit for us to get back into the swing of the system, but eventually it started flowing smoothly like it was when we were playing Beyond the Rim and The Jewel of Yavin. The decision to make Athena’s Jewel a reproduction antique Defender-class ship was based in two things: the LEGO version was cheaper than that of the Consular-class Republic Cruiser, and I really like that ship. Now, before you get excited about them going to Alderaan in a Rebellion-era game, just be aware I’ve set this game shortly before A New Hope, so Alderaan still exists… for now. After narrowly avoiding complete failure by falling bass-ackwards into an invitation to the gala, we took a few moments to change clothes and freshen up. Agents of the Chiss persuasion were hanging out in the lobby and we overheard them talking about Herrick, so he decided to not return to the room with us and go hide elsewhere. We make plans to meet with him at the gala. At this point, I am convinced whatever greater power there is controlling the universe has it out for us. Forget crime lords or the Empire, FATE itself seems determined to destroy our lives. Once we arrived at the gala, I got busy working the room. We saw some of the other bidders, like the Togruta, Shraya. Zekra Fol accosted Herrick and Xena, and demanded to know if their killing of Razer was a hit. I got her alone and assured her it was actually an accident before asking her if she was familiar with the plight of the Duros people. I explained how our planet was folded into the Corellian sector against our will and how my father died to ensure my mother and I escaped so we could continue to fight for Duros independence. She was less than sympathetic; I don’t know what I expected from a mammal. I managed to anger Shraya to the point that she left the gala; I would have thought a Togruta would be sympathetic since the Empire is known to have no love for non-humans. While the others tried to figure out ways to steal the Jewel of Yavin, I continued to work the room. Sadly, no one cared to learn about the plight of the Duros. You’d think the mammals would have a greater appreciation for THE PEOPLE WHO BROUGHT HYPERSPACE TRAVEL TO THE GALAXY. Without us, they’d still be flitting about in deathtraps, clinging to their atmospheric-skimming orbitals and unable to reach out to the stars. But that’s okay. No need to show the least bit of respect for the species that allow them to crawl out of the primordial muck that was their worlds before interstellar travel. At some point in the evening, Herrick and Xena got called into a meeting with Kaltho the Hutt. That’s not going to go well for them. Hutts have a lot of money, though, so I decided to see if Kaltho was familiar with the plight of the Duros. According to his Major Domo, he would be happy to give me a loan. Yeah, sure, I have no problem pledging my arms, legs, and first three children to the Hutts. The gala ended and someone won the auction. We knew it was important to get the money as soon as it was transferred; the gem would wait. We tracked down several banking droids we could slice to re-direct the funds and decided to go after the one furthest away. It would shut down for the evening first and would also take the longest to return to its charging station. If we failed at that droid, there were two more to try. We found it in a fairly deserted area and, using a combination of the restraining bolt I purchased and brute force, we wrangled it into a service lift. Xena sliced the lift to lock it down between floors so we could work on the droid in private. Having some sort of dataspike would sure have been handy, but she managed to get the funds transferred. Unfortunately she saw that her new benefactor, Kaltho the Hutt, was the winning bidder. I calmed her panic attack by pointing out that she wasn’t stealing from the Hutt. He… or she, I’m not sure which phase of life Kaltho is in, paid the auction house and we stole from the auction house. We didn’t have time to properly dispose of the droid and cover our track completely, though, so we sabotaged the lift and sent it crashing down to the bottom of the shaft with the droid in it. Hopefully, digging its “black box” out of the wreckage will take long enough for us to make our getaway. Slicing the droid took longer than we hoped, so, pressed for time, we bribed ugnaughts to get us to the proper maintenance tunnels to let us climb the central windshaft for our upcoming museum robbery. That bad feeling I had? Yeah, it hasn’t gone away. I have determined, that, as a player, a talky-charismatic character is NOT the right type for me. I’m pretty horrible at it. I’m also bad at planning heists. I think I would’ve been better off as a techy-type or another pilot. Live and learn. I pushed for greater usage of our Destiny pool this time, since we had so many Light Side points. I also pointed out as the session got late, that there was literally NO REASON for us not to use them on every roll since they were going to reset at the beginning of the next session. Frankly, I think that saved our asses. I’m beginning to think that the game expects you to use them freely, rather than hoarding them for when you think you might need a boost. Sort of like the Fate point economy in Fate games or Bennies in Savage Worlds. They’re not Hero Points from late D&D 3.X/Pathfinder or D&D 4E, to be using sparingly in cases of life & death. They’re necessary to keep the dice from totally screwing over your party. I still think FFG set some of the difficulty too high in some cases, though. The next session will be a one-shot of Fate (an Atomic Robo-inspired Fate Accelerated game, to be exact–Action Scientists of Tesladyne, Issue 1: The Madness of Doctor Frankenheimer) due to one of the key players in this heist being away on vacation. Depending on how attendance is looking for Hallowe’en, that may stretch into a two-shot. When we return to Edge of the Empire and The Jewel of Yavin, it will likely be the last session. Hopefully, we’ll have better luck than we did at the climax of the last Edge of the Empire adventure.